Sometimes one hero isn't enough - sometimes you need a full dozen. Mack's search for his dazzling dozen continues in the third instalment of this hilarious, action-packed fantasy series by the New York Times bestselling author of GONE. Time is short for Mack MacAvoy! He has less than 30 days to round up the rest of the magnifica and defeat the Pale Queen and her evil daughter Risky. It seems that the only way to do this is to learn the magical language of Vargran, and to do THAT they must travel to Europe to find the Key - an ancient engraved stone that will unlock its power. But can Mack, Jarrah, Xiao, Dietmar and Stephan locate the invisible castle of William "Blisterthong" MacGuffin, who guards the Key? And will The Key hold the power to save the world? 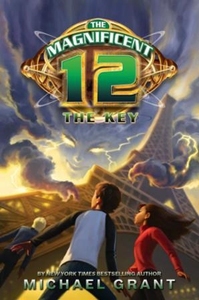 The Magnificent 12: The Key is another fast-paced episode in bestselling Michael Grant's hysterical fantasy adventure.